Like a chastened schoolboy, Sen. Tim Ashe (D/P-Chittenden) wrote 10 times on a whiteboard in the Senate Finance Committee's meeting room last week, "I do not need to fight every battle." But by Friday afternoon, evidence was scant that the 38-year-old chair of the Senate's tax-writing committee was heeding his own advice. With just weeks remaining in Vermont's legislative session, Ashe formally unveiled a proposed major restructuring of the sales tax that would lower the rate from 6 to 4.75 percent but would also expand the tax to cover not just goods but also services. Doing so, he argued, would stabilize and even grow what has become a declining source of revenue for the state. "For four months, we've been saying we want to have a map for the next two years so we don't have to make crisis financial decisions next year, knowing we're going to have another gap next year," he said. The impish Ashe, who sometimes sounds more like the leader of a think tank than the head of a legislative committee, has made no secret of his desire to make major changes to the state's tax code. The sales tax proposal is also hardly novel: The Blue Ribbon Tax Structure Commission recommended it in its much-discussed 2011 report. But to the lobbyists who lurk in the Senate Finance Committee toward the end of every legislative session, it's not always clear which battles Ashe is planning to fight — and which proposals he's using as bargaining chips. "Is that real, or is that just discussion for the future?" Vermont Chamber of Commerce president Betsy Bishop wondered last week when told the idea was resurfacing. Ashe insists the sales tax expansion is real, though it would not take effect until July 2016. Including it in this year's tax bill, he reasons, would give the Department of Taxes more time to plan its implementation and would spare lawmakers another wrenching tax debate next legislative session. Until Friday morning, the Finance Committee's agenda made no mention of the proposal. But by the time it came up for debate late that afternoon, more than a dozen lobbyists ringed the cramped committee room. Ashe's colleagues had plenty of questions for their chair. Sen. Kevin Mullin (R-Rutland) noted that the bill would expand the sales tax to electric and gas service. He worried about increasing Vermonters' electric and heating bills. "Everything is a choice in front of us," Ashe responded, noting that the committee can decide what services to tax. "Let's not begin by picking fights." To Isaac Chavez, chief executive officer of the Vermont Realtors, the entire proposal is worrisome. Buying a house requires a slew of services that could be taxed under the plan, including those provided by real-estate brokers, lawyers, home inspectors and mortgage providers. "Just the amount of red tape, it's more trouble than it's worth," he said. Chavez hadn't expected the sales tax expansion to see the light of day this year. He'd been busy opposing other tax proposals, such as House-passed plans to cap itemized income tax deductions and to add a surcharge to the property transfer tax. For Chavez, the end of the legislative session is like a game of Whack-a-Mole. It's unclear whether Ashe's sales tax plan will survive that game. House Speaker Shap Smith (D-Morristown), who used to serve on the tax-writing Ways and Means Committee, says he likes the concept of broadening the sales tax, but he thinks a 4.75 percent rate is too high. The new sales tax rate has to be low enough for consumers to notice they're paying less for goods before they can be sold on a tax on services, he said. Shumlin is more dismissive. "I've never been enthusiastic about expanding the sales tax to more goods and claiming we're going to reduce the rate," he said. This year, there are more tax moles to whack than usual. That's because lawmakers are considering raising as much as $60 million in new revenue. Some of that would go toward filling a $113 million budget gap, while some would finance new spending priorities, such as cleaning up phosphorous-clogged Lake Champlain and tackling health care inequities. "That's a serious amount of money," said Jim Harrison, president of the Vermont Retail & Grocers Association, whose members are on high alert over several of the tax proposals. Bishop, the Vermont Chamber president, has been keeping a running tally of all the taxes and fees the legislature has proposed so far. By last week, 25 items had made the list, though she warned it was probably incomplete. "I'm adding things every day," she said. The House and Senate's Democratic majorities and the Democratic governor agree on the idea of raising some amount of taxes this year, but each has a subtly different approach. Rep. Janet Ancel (D-Calais), who chairs the Ways and Means Committee, and the House settled on the idea of capping the amount Vermonters can deduct from their income taxes for expenses such as mortgage interest, charitable contributions and health costs. "I like ours because it's simple. That was part of the appeal. It doesn't pick favorites," Ancel said. Ashe wants to pick favorites. His committee would offer income tax credit for in-state charitable contributions while excluding those going out of state; currently, both can be claimed. He's proposed a cap on deductions for higher mortgages. And he wouldn't cap medical deductions. "There is a great simplicity about what the House has done," Ashe said. "The thing is, that means you're treating all the things equally. Well, we haven't heard an outcry from people saying, 'Treat a medical deduction the same as something else.'" While tax proposals can originate in nearly any legislative committee, they must eventually pass muster with the Senate Finance Committee. Typically, they arrive in a clump at the end of the session, giving Ashe and his colleagues substantial power to decide which will be signed into law. This year, according to veterans of the process, there is more uncertainty than usual. "This has been as tough a year as any I've ever seen, and I've been doing this over 20 years," said Andrew MacLean, a Statehouse lobbyist with the firm MMR. "People are scrambling for ideas. It seems like a lot is up in the air." By the end of the session, it often seems as if lawmakers have proposed every tax conceivable. But not all of them see the light of day. One of the most controversial, a 2-cent-per-ounce excise tax on sugar-sweetened beverages, appears all but dead. Last month, the House Health Care Committee proposed levying such a tax to partially finance a $47 million health care reform package. The House Ways and Means Committee was less supportive of the concept and reduced it to a half-cent-per-ounce tax. Even that was too much for many House Democrats, so Speaker Smith refused to give it a vote on the House floor. Now Ancel's and Ashe's committees are considering a different approach: eliminating the sales tax exemption for soda, candy and other products. But they differ in how they would spend the money. On Friday morning, the House committee voted to invest it in the now-diminished health care reform package. By the time the afternoon arrived, the Senate committee was discussing using it to balance next year's base budget. Harrison, who represents grocers and retailers, remains wary that the far larger excise tax could yet reemerge. "Everything is potentially alive until they adjourn," he said. Less likely to be revived is Shumlin's moribund proposal to institute a 0.7 percent payroll tax. In his January budget address, the governor outlined a plan to raise $90 million in state dollars through the new tax, which would draw down another $100 million in federal funds. The money would, in part, boost underfunded Medicaid payments to providers, thereby reducing the cost-shift to insured Vermonters. Business groups strongly opposed the plan, and the House and Senate both rejected it. Last week, Sen. Mullin proposed a new $27 million plan to address the cost-shift. But instead of relying on a payroll tax, he would increase taxes on cigarettes, health insurance claims and employers who don't provide insurance. 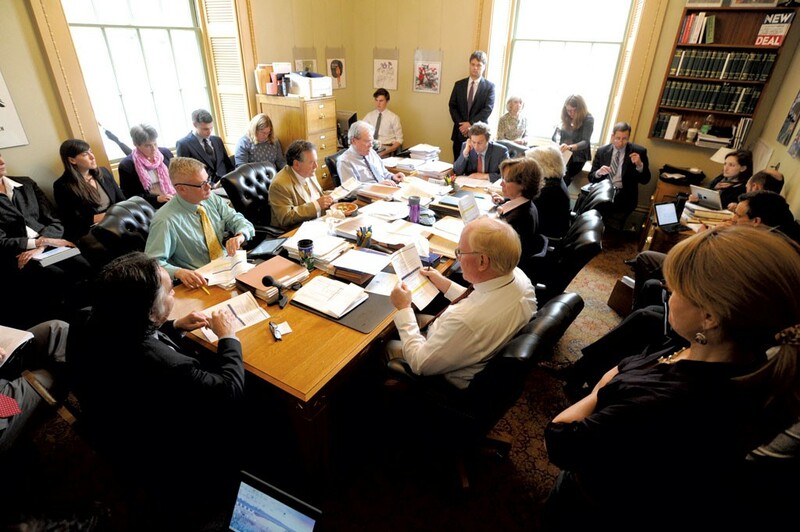 As Mullin gathered support for his proposal Friday, Shumlin called a group of senators into his Statehouse office to pitch his payroll tax once again. "At some point someone's got to go, 'Hey, how come we haven't looked at this payroll tax?'" Shumlin said in an interview after the meeting. "I do think they're having a sobering moment." After 19 years as a legislator and five as governor, Shumlin surely agrees with the maxim Ashe wrote 10 times on his whiteboard last week: He doesn't need to fight every battle. But he's not ready to give that one up yet.